Shaiha's Ramblings: Getting Smaller or Expanding? When I was younger, I used to sit and talk with my Gram for hours about the changes that she had seen in her lifetime. When she was age, people very rarely moved very far from where they were born. You had a lot of family surrounding you since your Aunt might be living a couple houses down the street and your cousins all within a mile of you. If one was in trouble, you didn't go to the government for help. That was what family was for. Women were slowly becoming more independent yet raising a family and taking care of the home. My Gram worked along with my Grandfather maintaining the books for his business. They were considered pretty progressive since they were an early adopter of the television. Gram was able to watch a lot of changes from when she was a young girl until she was extremely elderly yet those are nothing to the changes that I have seen in my lifetime. I remember when I was a teenager I had to watch how long I talked on the phone because party lines were still popular. Now I have a cell phone and don't have to worry about long distance charges even when I am calling someone on the other side of the country. Oh and let's not forget how I carry a phone with me almost all of the time. Do you remember how easy it used to be to escape phone calls? Now people can find you almost everywhere. And music. I used to have some old 78's (and I bet that a lot of people will have NO idea what those are) as well as 45s and lps. I remember how excited I was when cassette tapes and walkmans came out. Nowadays people are able to purchase individual songs to add to their playlists on their phones or mp3 players. The biggest change however is the internet. It really has made the world smaller. 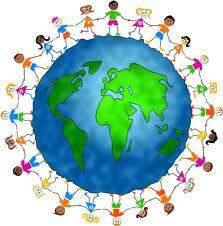 Through social networking sites such as Facebook, I am able to chat with people from all over the world. Someone that lives in Europe with their different customs is not as alien as they were when I was a kid. Even this blog post, I am writing it while I am sitting in Washington state here in the US but I have NO idea just where my readers will be when they get a chance to take a look at it. So is the world getting smaller or is it that my horizons are expanding? I don't have kids but I can only imagine the changes that will be occurring within the lifetimes of my friend's children. Any guesses? If only all these "improvements" were universal, and ensured that there were less suffering and inequity. I'm not convinced that even though I converse with people I will never meet, the result is positive all round. I am hoping the biggest change our children will bring about is to stop and reverse the damage to our planet before it is too late. End of my sermon. Wistful for the old days here in Altantic Canada. No clue what will come next. I love the Internet, I'm on it all the time. Unfortunately there are many bad things that have come with it. I worry about today's kids interpersonal skills - they text each other when they are sitting right next to each other. Do they know how to have a conversation? Plus - any freak (pedophiles, etc) can find someone on the Internet that is just as disgusting as they are, and they encourage each other. Awful. But I also think about the wonderful community for stay-at-home moms - I would have loved to have that when my kids were little. I dunno, my kids are kind of amazed that there were no microwaves, that we walked to school, and that we had no way to know who was calling when the phone rang!